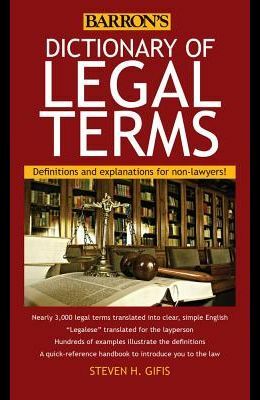 Updated to include new terms and to incorporate recent changes in laws and judicial interpretations, this handy dictionary: Contains over 2500 legal terms defined in clear, easy to understand English Translates legalese for the layperson Includes hundreds of examples to illustrate the definitions Is an ideal book for quick reference or to learn more about the law: Non-lawyers will appreciate the way this book cuts through the complexities of legal jargon and presents definitions and explanations that are easily understood and referenced. The terms are arranged alphabetically and given with definitions and explanations for consumers, business proprietors, legal beneficiaries, investors, property owners, litigants, and all others who have dealings with the law. Find definitions on everything from Abandonment and Abatable Nuisance, all the way through to Zoning.